with the lack of affordable wagons in the US, the ET was a no brainer. Hyundai has more features in this car than any other manufacturer's sub-$20,000 car. Room is outstanding, as is visibility and brakes. Much better than owning a gas guzzling SUV. I matched the ET against the Tucson. 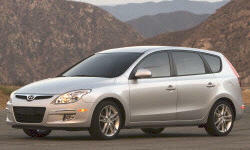 Why the 2010 Hyundai Elantra Touring? best brakes I have every encountered. Stops on a dime. no other small car provides rear passenger comfort like the Hyundai Elantra Touring. Why Not the 2010 Hyundai Elantra Touring? transmission replaced at 42,000. I expect it won't be the last time either. I yearn for a bit more floaty suspension. This rides more like a sports tuned suspension. very odd steering. It is nice and tight, but it also seems to require a lot more minor course corrections to keep it straight down the road. I wish the ET had a 6 speed transmission. I'm sorry they don't make it any more. The visibility in the GT is not as good, especially through the rear window.